There’s always a difficulty in having a progressive discussion when the different parties come from different domains. With different world views or attitudes come different terminologies. What if we could communicate a bit more effectively between domains? 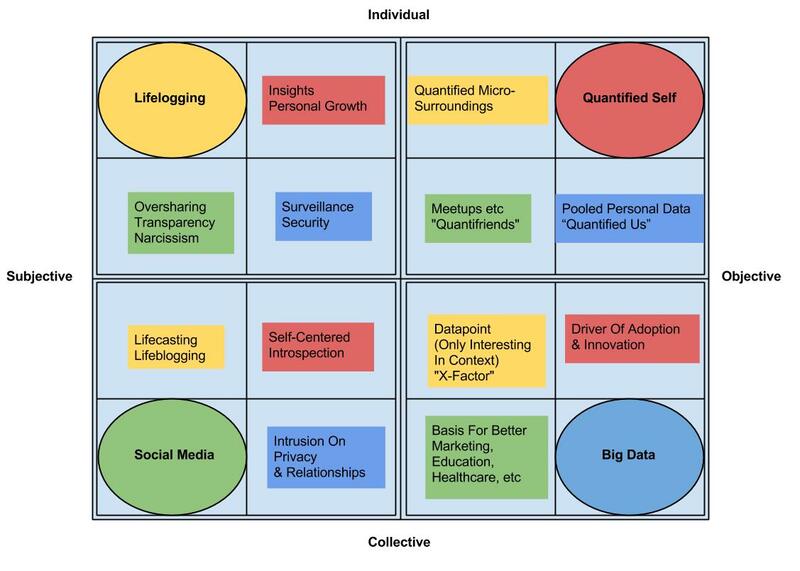 The model presented in this post attempts to map out how players from the “opposing fields” of Lifelogging, Quantified Self, Social Networking (or “Social Media“) and Big Data look at and think of each other. Since I started working at Narrative a year ago, a company in the “lifelogging” field, I’ve been immersing myself into these domains of personal activity tracking, hi-tech sensor devices that record and measure various aspects of your life, and algorithmic data engines that try to make sense of all this data. I’ve been noticing that there is a huge variety of people’s reasons to be in this field. Just take a look at the documentary Lifeloggers for an overview of lots of different types of stories! Because of this, I wanted to try and find a common ground, a bigger terminology, a way to reconcile all these different attitdes so that we can communicate and collaborate in a more fruitful capacity. Let’s go! The upper left is the “intentional” or the “I”. This is the domain of “beauty” – spirituality, emotion, art, cognition and all those fluffy things. The lower left is the “cultural” or the “We”. From this domain spring morals, our collective agreement of “what’s good” inside a group. The upper right is the “behavioural/material” or the “It”. The hard sciences, what’s objectively observable and measurable. 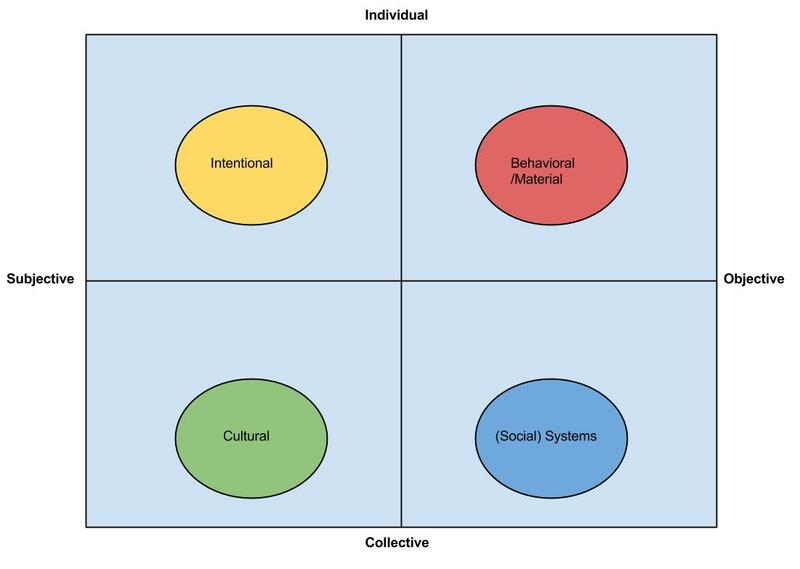 The lower right is the “(social) systems” or the “Its”. Traffic, weather, politics, law, etc – the chaotic or predictable interplay between many soulless entities. Read Also: Marketing & Branding : What's in a Name Anyway? Of course, bear in mind that all of the above contain massive generalizations – just like maps always do. Now, finally we’ll expand the quadrants to something akin to four corners of a boxing ring, and have all of them face each other. How do their respective positions affect their views of one another? The way to read the above illustration is to look at one quadrant at a time. Then you can see how the circled domain views the other domains. For example, starting from “Lifelogging“, it looks at “Quantified Self” and sees “Insights and Personal Growth“, it looks at “Social Media” and sees “Oversharing, Transparency and Narcissism“, it looks at “Big Data” and sees “Surveillance and Security“. And so on, across the quadrants. It gets a bit heady, I know! This is where I’d like to invite for discussion. 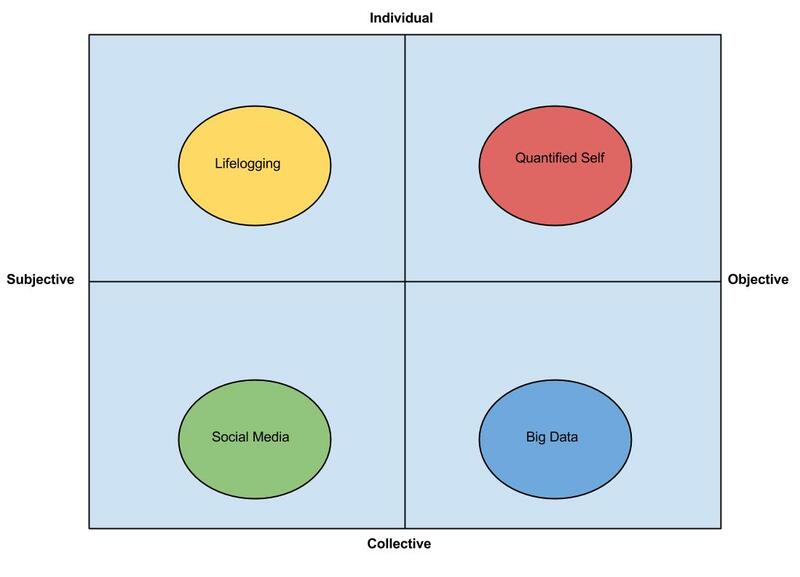 Do you agree with the positioning of the four domains in one quadrant each? Does it make sense to generalize their respective reasoning and attitude towards each other? And how can this model be of help for people from Lifelogging, Quantified Self, Big Data and Social Media to come together? Is there even a conflict of interests to start with? Like all theoretical work this model is very derivative, so credit where credit’s due. I found the writings of Ken Wilber eight or so years back, right after having been through more or less of a spiritual/personal crisis. His “integral model of everything” or “AQAL” (short for All Quadrants, Levels, lines, states and types) felt like intellectual salvation in a sea of conflicting domains to my mindset of wanting to piece together all fragmented beliefs/worldviews that had to be reconciled for me to pick myself up and move forward again. Next Post Next post: Results-Only Workplace Or Workplace-Only Results?